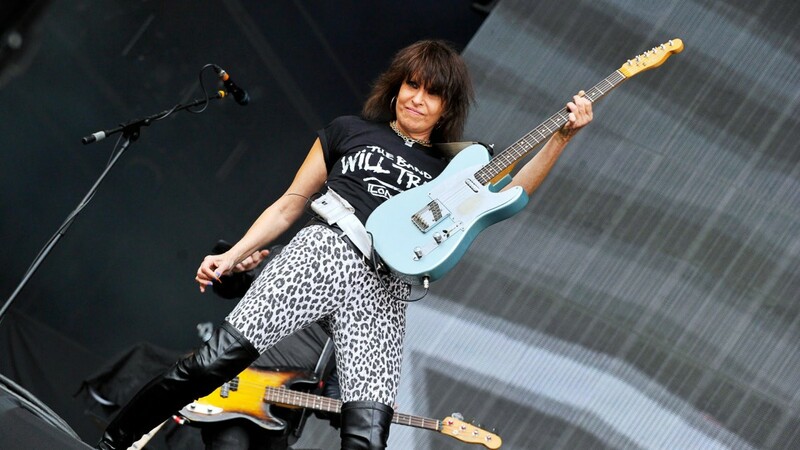 A recent radio interview with Chrissie Hynde reveals NPR’s colossal limitations, the covert sexism of Morning Edition host David Greene, and gender double standards. Why aren’t shocked about Hynde’s treatment rather than the interview’s roughness? Hynde: You know, it’s just a three minute rock song. It’s…I don’t think it’s as loaded as that. Greene: People certainly thought in its day [sic] as being very different and really emboldening women. Hynde: Okay, well I’m not here to embolden anyone. From here, the NPR producer cuts away in aloof and hilarious fashion to a lengthy clip of “Brass in Pocket” to pad out time, leaving the listener wondering what embarrassing (and possibly more interesting) bits were left on the cutting room floor. Perhaps there were many minutes in which David Greene, a man who seems incapable of improvisation, was left with his tongue capsized in a Gordian knot. Greene tells us that “Chrissie Hynde is a really tough interview,” even though Hynde sounded perfectly relaxed with Marc Maron last December and, most recently, with Tig Notaro. Greene: And the Rolling Stones. They came — I mean, I, I loved reading about how you sort of took some of the staging off to take it with you, almost as a souvenir. Hynde: Yeah. Do you want me to repeat the story? Greene: I’d love you to. Hynde: Is that the question? Greene: No. I’d love you to. Hynde: Can I just not repeat the stories that I’ve already said in the book? Can we talk about things outside of that? Is that possible? I don’t want to do a book reading, as it were. Let’s unpack why this is terribly insulting to Hynde and why Hynde, much as any woman should, might react as hostilely as she did. Here is someone who has been creating music for many decades. She’s not a neophyte. She’s an accomplished rock performer. Instead of talking to her about The Pretenders, Greene has opted to paint Hynde as some Rolling Stones groupie plucking staging as souvenirs. Hynde has given Greene a big clue, pointing out that she’s not some automatic doll who performs book readings. Compare this with Greene’s fawning treatment of Stones guitarist Keith Richards back in September. Not only was Richards permitted the courtesy to smoke inside the studio, but Greene gushed about Richards’s considerable accomplishments (children’s book author, raconteur, solo artist) in a manner so obsequious that you’d think he was the Pope. It would never occur to a sycophantic sexist like Greene to ask Richards what he thought of the Pretenders, much less paint him as some febrile fanboy. Greene: No, I would just like to hear some of the emotions of why you love the Rolling Stones so much. I mean, you were — you were taking some of the notes that people had written for Mick Jagger and Keith Richards and taking them home with you. I mean, what was driving you? Hynde: Well, well, I just loved the bands. That’s what drove me all my life is that I just loved the bands. Back in those days, nobody thought I wanted to grow up and be a rock star. Nobody thought about fame. Nobody thought about making a lot of money. I just liked music and I really liked rock guitar. I didn’t think I was going to be a rock guitar player because I was a girl. I would have been too shy to play with, you know, guys. It’s bad enough that we have to suffer though NPR’s crass abridgements of complex emotion into superficial seven minute segments, but it’s hard for any progressive-minded listener to hear a talented and interesting woman, one who emerged from an uncertain blue-collar existence to a Rock and Roll Hall of Famer, reduced to something akin to a toy. If Hynde were a man, this interview wouldn’t be a controversy. One would think that the Twitter crowd, so eager to denounce such demoralizing portraits of women, would have glommed onto an autonomous voice being diminished by an incurious and inattentive fool. But instead the shock is with an interview departing from mealy-mouthed form. The time has come for more women to stop letting “nice guys” like Greene diminish their accomplishments and for all radio producers to be committed to organic conversations. If NPR insists on being a forum for gutless toadies and the celebrities who tolerate them, then perhaps the cure involves opening up the floodgates to every voice on the spectrum with thought and compassion. Of course, podcasting has been doing all this quite wonderfully for years. So if Greene cannot adjust his timid mien to the 21st century, then perhaps his stature should perish. Terry Gross, recently referenced in this story involving a Jonathan Franzen interview that had been cut for broadcast, has been kind enough to respond to my questions. She informs me that “there has been no self-censorship or deals cut to suppress the Franzen interview.” Gross tells me that the audio for the original October 15, 2001 broadcast should have been available on the Fresh Air website and that she was surprised to learn that this wasn’t the case. Fresh Air has asked NPR to restore the original Franzen interview on the website, and I will follow up next week to see if it’s there. While I agree with Gross that a certain degree of audio cleanup is necessary to ensure a professional broadcast, I still remain mystified why additional broadcasts are edited further. I also wonder why such concerns as “dated” material should even matter. After all, if the listener knows that she’s listening to an interview that aired before, why then should such a distinction matter? I have sent Gross a followup email, pointing out that abridgment is not indicated on the broadcast and that the main page for the Franzen repeat does not read, “This is an excerpt from an October 15, 2001 interview,” but reads, “This interview first aired October 15, 2001.” Thus, the listener might insinuate that what she is hearing is the same interview that aired before. This specification would certainly put Gross in a more ethically sound position. Nevertheless, this offers some insight into how Gross and Fresh Air operates. And I am glad that she has at least taken steps to restore the original interview. I only hope that Gross will be more forthright about how future rebroadcast interviews are edited, if only to escape an ombudsman’s wrath. 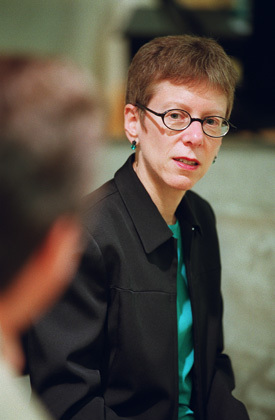 Did Jonathan Franzen Cut a Censorship Deal with Terry Gross? So, as it turns out, it was Terry Gross’ fault; even though she started off the interview by gushing, “I read your book and I loved it!” and did not press him in the least or follow up on his blatantly chauvanistic take of Oprah’s audience, she was, apparently, out to get Jonathan Franzen . . . a poor, “inexperienced” lad with only two previous books and hundreds of previous interviews and public appearances under his belt. And here is the quote reported by the Chicago Tribune and the Boston Review. I mean, so much of reading is sustained, I think, by the fact that women read while men are off golfing or watching football on TV. Or, um, you know, playing with their flight simulator or whatever. After this, we hear Terry Gross ask her next question. The other part of the quote, as reported by Johnson, “I worry — I’m sorry that it’s, uh — I had some hope of actually reaching a male audience and I’ve heard more than one reader in signing lines now at bookstores say ‘If I hadn’t heard you, I would have been put off by the fact that it is an Oprah pick. I figure those books are for women. I would never touch it.’ Those are male readers speaking,” is missing. If Terry Gross is a journalist, then she has the responsibility to maintain the full record of this conversation, or at least apprise her listeners that the interview was modified. I do not yet know Ms. Gross’s motivations, but if she is willfully allowing her program to be pressured by authors and/or publishers, then it seems to me that the Literarian Award, which purports to “recogniz[e] the important contribution she has made to the world of books — and to our understanding of literature and the writing process — through her probing and intelligent interviews with authors” does not appear to recognize an interviewer who thoroughly probes her subjects. Indeed, the National Book Foundation has honored an ostensible “journalist” who has failed to preserve the historical record. At the very least, Gross should have observed — both on the September 6, 2002 repeat broadcast and on the NPR page representing the broadcast — that the interview was edited or tampered with. I have sent an email to Terry Gross asking for clarification on this matter. I will update this story if I learn any additional details.